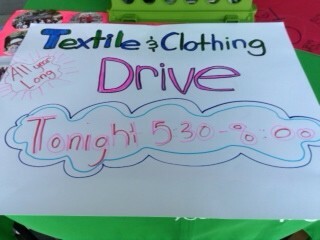 Green Your Move Outfundraising program. The initiative was intended for students to lighten their move-out load, by recycling and preventing clothes from ending up in a landfill. In order to make the eco-friendly fundraiser flow smoothly, USAgain bins were strategically placed throughout Cal State L.A.’s Student Housing Complex for student residents to access. The program was considered a huge success as students recycled 3,077 pounds of clothing, which translated to 7 million gallons of water saved and over 46,000 pounds of CO2 prevented. USAgain, a leader in the textile recycling industry since 1999, with corporate headquarters in West Chicago, is a for-profit company that recycles and resells reusable clothing and other textiles. Its mission is to provide consumers with a convenient and eco-friendly option to rid themselves of excess clothing, which is then diverted from landfills and resold to markets in need of affordable clothing. USAgain maintains more than 12,500 collection boxes in 19 states and has over 200 employees. USAgain has partnered with more than 1,000 organizations – including schools, churches, food banks, hospitals, fire stations, humane societies and youth groups – as part of its charitable giving program. For more information, visit www.usagain.com. Textile recycling program helps students go green and save green. ANAHEIM, CA (July 23, 2015) – Marymount California University (MCU) partnered with USAgain, a for-profit textile recycler, as part of the company’s Green Your Move Out program. As a result, the university collected a total of 1,095 pounds of surplus clothing and shoes. For the program, USAgain bins were placed at convenient locations on campus for students and faculty to access. 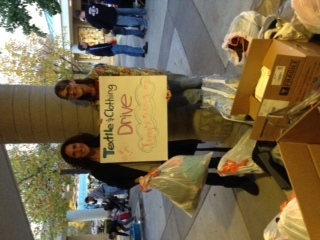 The event successfully collected a whopping 1,095 pounds of surplus textiles. While reducing waste on campus, the partnership helped save over 2 million gallons of water and prevented 16,425 pounds of CO2 emissions. USAgain offers year-round eco-friendly fundraising programs for schools called “Greenraisers.” With no additional costs and no added work for participating schools, these education-based fundraisers help students gain awareness of textile recycling and the costs associated with campus waste, while also earning funds for every pound of textiles collected for recycling and reuse. Check out the details athttp://www.usagain.com/greenraiser. Residents of the City of Chula Vista showed huge support for textile recycling by bringing in bags full of clothes and shoes at the Earth Day recycling event on April 25 at Otay Ranch Town Center Mall. The event helped residents recycle surplus household items conveniently. Over 900 community members came to drop off household hazardous waste, e-waste, medical waste, tires and textiles. 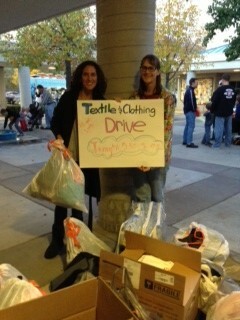 The textile-recycling portion of the event helped to keep clothes and shoes from going to landfills. Around 3,955 pounds of textiles were collected, which resulted in preventing more than 27,685 pounds of carbon dioxide emissions from entering the atmosphere. Funds raised from the clothing drive were given to support Computer 2 San Diego Kids, a local non-profit supporting families with technology assistance to improve their educational options and their futures. According to EPA, 85% of textiles are going to landfills, that is 12 million tons pf perfectly reusable or recyclable clothing going to landfills every year. Events like this help raise awareness about textile recycling and gives communities an opportunity to divert clothing from landfills. USAgain is located in 19 states, and participates in more than 100 similar recycling events throughout the country every year. 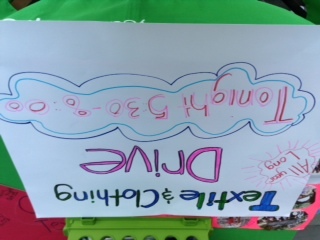 To host a clothing drive or textile recycling program, email info@usagain.com. USAgain’s Green Your Move Out fundraising program proved recycling on college campuses is a win-win for reducing waste and helping students take home a lighter load. 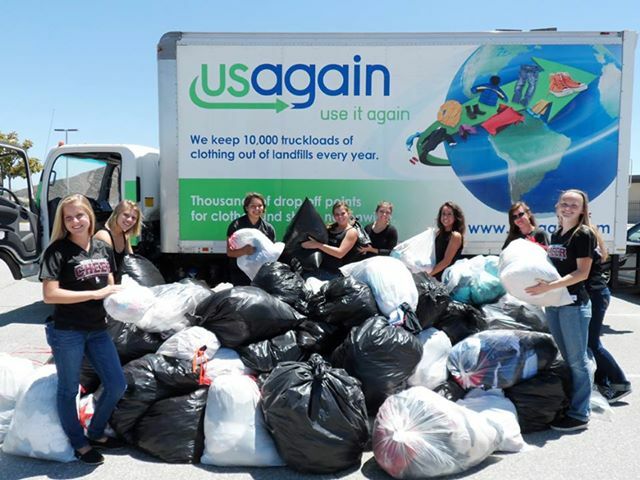 California State University in San Marcos, Calif., (CSUSM) collected a total of 1,272 pounds of unwanted clothes and shoes this spring with USAgain’s bins conveniently placed around campus. CSUSM students can pat themselves on the back for helping to avoid textile wastes that would’ve summed up to 8,904 pounds of CO2 emissions. 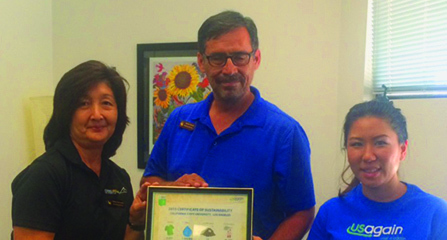 The university also helped save over 1.78 million gallons of water. “The USAgain bins at CSUSM student housing provided a convenient method for students to clean out their apartments during move out while giving back to a wonderful cause,” said Leslie Nevins, Associate Director of Residence Education, UVA & The QUAD. Separately CSU University Village gathered 511 pounds worth of textiles, and CSU Quad Apartments gathered 761 pounds with USAgain’s recycling bins during the Green Your Move Out program this May. CSUSM’s Student Move Out program began on Thurs., May 22, and USAgain bins were available for students to help with reuse alternatives. The Environmental Protection Agency (EPA) estimated that 12 million tons of textiles were sent to landfills in 2012. The goal of this program is to help students take action in waste reduction to create “green” campuses. 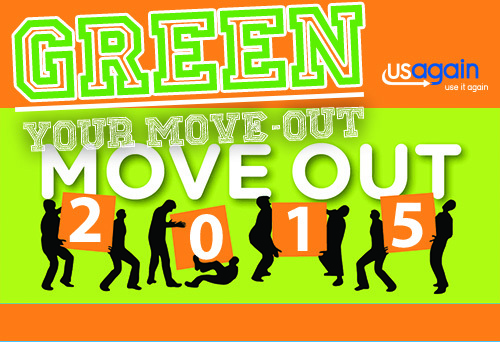 All textiles from the Green Your Move Out program will be reused or recycled depending on the quality of items. USAgain — a leader in the textile recycling industry with corporate headquarters in West Chicago, Illinois — is a for-profit company that recycles and reuses clothing, shoes and textiles. Its mission is to provide consumers with a convenient and eco-friendly option to rid themselves of surplus clothing, which is diverted from landfills. In 2013, USAgain was awarded an “A” rating by the Better Business Bureau. It maintains more than 14,000 recycling bins in 19 states. USAgain’s Southern California division was proud to support Movie Night at Robinson Elementary School in Rancho Santa Margarita, CA. The event, sponsored by the PTA, was an opportunity for students to have fun and collect clothing to raise money for the school. 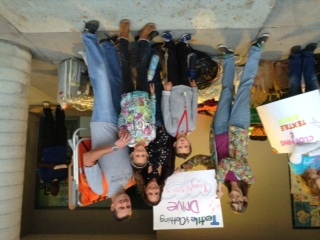 Students and parents combined to collect 555 pounds of clothing at the event. 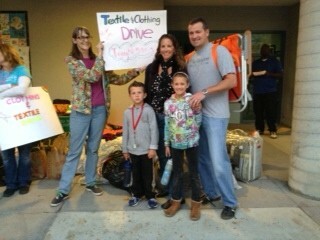 Great work, Robinson Elementary! USAgain and West Valley High School in Hemet, CA, partnered to help raise funds to purchase outfits for the school’s cheerleading squad. In total, over 1,600 pounds of clothes, shoes and household textiles were collected for reuse and recycling as part of the fundraising effort. The West Valley cheerleading squad got some firsthand experience recycling clothing and raising money for new uniforms. 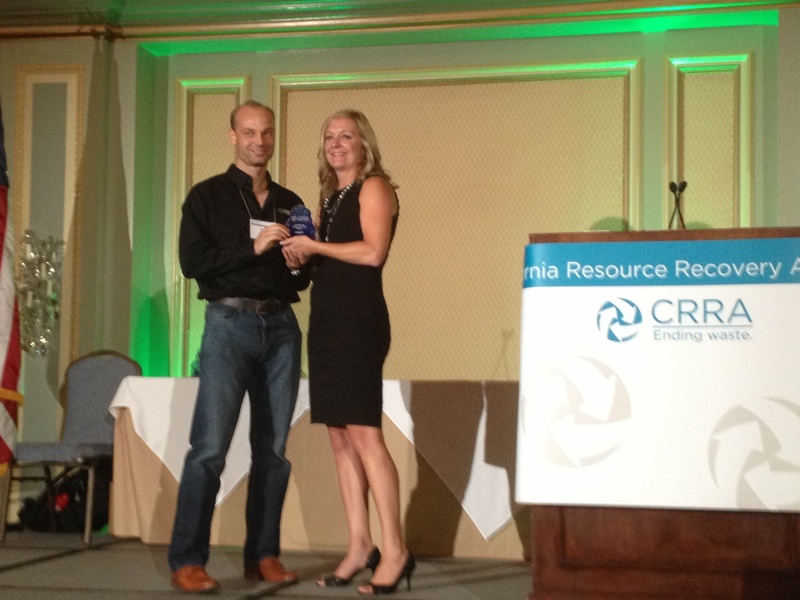 We look forward to working on school fundraising events in California in the future! USAgain SoCal helped West Valley High School in Hemet, CA organize a clothing drive fundraiser to raise money for new cheerleading uniforms. 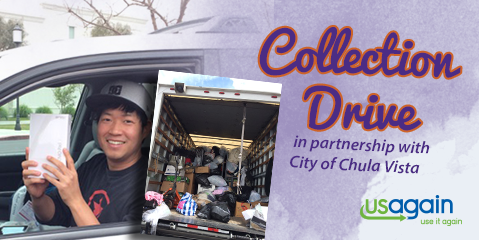 With our help, they managed to collect over 1,600 pounds of clothing, shoes and other textiles. Well done, ladies! August 9, 2012 — Santa Monica residents will have two opportunities to get rid of their old stuff without wasting it. This month, the City will join forces with USAgain to give residents a chance to recycle their shoes, clothes and other textiles, while in September, residents will have a chance to make some cash off their household junk at the 3rd Annual Citywide Yard Sale. On August 18 from 9 a.m. to 2 p.m., USAgain — a Chicago-based textile recycling company — will be collecting clothes, shoes and textiles at the City Yards at 2500 Michigan Avenue. Material collected by USAgain is sold wholesale to second hand shops, according to the company’s web site. For those who require a more monetary incentive to get rid of their clutter, on September 22 from 8 a.m. to 3 p.m., Santa Monicans will be encouraged to hold yard sales in front of their homes all throughout the City. Hosted by the City’s Resource Recovery & Recycling Division, this “Fall Cleaning” event gives residents a chance to clear out their boxes and make some money while they’re at it. “Residents and local organizations are encouraged to sign up and enjoy the benefits of a catalog listing their featured items and a resource list of charitable organizations accepting donations,” City officials said. Sellers should register online at www.smgov.net/r3 before September 14th, officials said. Then, on September 22, sellers only need to set up shop outside their homes. For those interested in buying, a map of registered sellers — and what they will be selling — will be available on the same site. “After collecting a wad of cash from your treasures, survey what is leftover and determine what can be donated to local organizations using the Reuse Resource List available online,” officials said.